FOX SPORTS to showcase NFL Super Bowl XLVII in the Philippines - Hello! Welcome to my blog! January 31, 2013 (Manila) – FOX International Channels (FIC) Asia, News Corporation’s international multi-media business and Asia’s leading pay-TV network, announced today that FOX SPORTS will be showcasing the LIVE broadcast of the highly anticipated 2013 National Football League (NFL) Super Bowl XLVII on Monday, February 4 at 7.30am (HKT), featuring the San Francisco 49ers and the Baltimore Ravens. The 2013 Super Bowl XLVII will be held in New Orleans and features the newly-crowned AFC Champions Baltimore Ravens, who survived a tough playoff season against formidable conference rivals, such as Peyton Manning’s tough Denver Broncos and ending Tom Brady’s quest for his fourth Super Bowl by beating the New England Patriots in the AFC Championship Game. 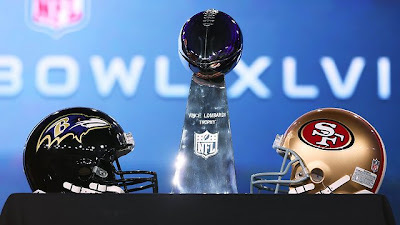 The NFC Champions San Francisco 49ers also had an inspiring run to this year’s Super Bowl by beating 2010 Champions Green Bay Packers in the Divisional Playoffs followed by the Atlanta Falcons in the NFC Championship Game. History appears to be in their favour as the San Francisco 49ers are the only team never to have lost in the Super Bowl with a 5-0 winning record. The 2013 Super Bowl also features several intriguing tales that go beyond the tape, such as two brothers who will coach opposing teams on America's biggest sports stage in Jim and John Harbaugh. The Harbaugh brothers will become the first siblings in history to coach against each other at the Super Bowl when Jim's San Francisco 49ers goes up against John's Baltimore Ravens on Monday morning. Another story-line includes the inspirational 37-year-old leader Ray Lewis, who recently announced that he will be playing his last game as a Baltimore Raven after the Super Bowl. Lewis is the last player remaining from the Ravens' inaugural season, earning himself 13 Pro Bowl appearances and the honour of being the first defensive linebacker to win the Super Bowl Most Valuable Player award, and will be looking to make his very last season count and finish his career on a high next Monday. FOX International Channels (FIC) is News Corporation’s international multi-media business. We develop, produce and distribute 350 wholly- and majority-owned entertainment, factual, sports and movie channels across Latin America, Europe, Asia and Africa, in 37 languages. These networks and their related mobile, non-linear and high-definition extensions reach over 1.1 billion households worldwide. We also operate a global online advertising unit .FOX (“dot-fox”) specialized in online video and display, and four TV production houses. In Asia, FIC operates or distributes 33 channel brands, including the FOX, STAR and National Geographic brands, with over 100 feeds across 14 markets, As the leading pay-TV network in the region, FIC reaches more than 550 million cumulative subscribers across Asia Pacific and the Middle East with offices in Hong Kong, China, Taiwan, Japan, Korea, Singapore, Malaysia, Indonesia, Philippines, Thailand, Vietnam, India, Australia, New Zealand and the UAE. For more information, please visit www.foxinternationalchannels.com.